Results of a new rice imagery study show successful prediction of rice nitrogen uptake at panicle initiation (2018 Rice R&D Update from AgriFutures). The study validates the possibility of generating nitrogen topdressing recommendations directly from remotely-sensed data with reduced or no physical sampling. For this study, Ceres Imaging provided aerial imaging technology in cooperation with researchers from the NSW Government Department of Primary Industries (Brian Dunn, Tina Dunn, Craig Hodges and Chris Dawe), Charles Sturt University (Remy Dehaan) and the University of New England (Andrew Robson) as part of the AgriFutures Australia project PRJ-009772. The study compared a diverse array of remote sensing technologies including satellite, drone and aerial imagery and found that Ceres Imaging data had the highest correlation with on-the-ground measurements of nitrogen uptake. 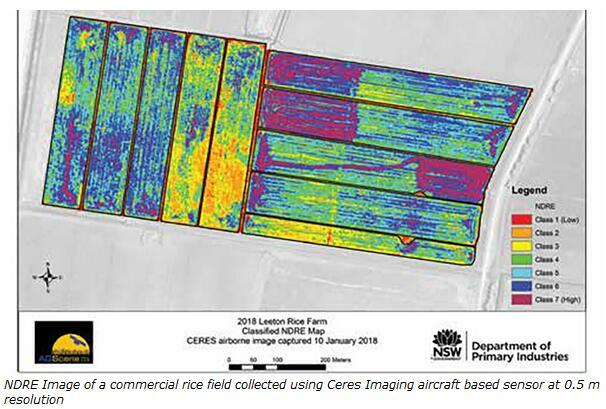 “After investigating several drone, satellite and aerial imagery options, Ceres Imaging was found to provide the best results at an economical price,” said Brian Dunn, research agronomist at the NSW Government Department of Primary Industries. In the 2015–18 seasons, remote sensing of rice for nitrogen requirements was tested on large plots over three seasons in Australia. At the outset of the project, a range of sensors was tested, but this number was reduced in the 2017–18 season as the project continued testing with the sensors best suited to rice crops and the rice-growing environment. Experiments were established at Leeton Field Station and Yanco Agricultural Institute, where rice was topdressed with varying rates of nitrogen just before the application of pre-permanent water. This provided a range of nitrogen uptakes at panicle initiation (PI). Ceres Imaging collected images via cameras mounted in a manned aircraft of both test fields and several commercial rice fields at multiple wavelengths, including red edge, which were reported as “high quality” and “easy to utilize” by researchers in the study. The study’s results showed Ceres Imaging data, correlating NDRE with the physical measurements of nitrogen uptake collected in the nitrogen by variety experiments, was very encouraging, producing an r^2 = 0.92. 1. Remote sensing is a viable option for generation of nitrogen topdressing recommendation maps for rice fields. Imagery collected from satellite or manned aircraft were the only scalable options, whereas drones were seen as less appropriate given challenges in collecting data over large areas during the short PI timing window. 2. Several remote sensors that collect red edge imagery were tested, with all showing considerable potential for predicting rice nitrogen uptake at panicle initiation. Preliminary algorithms predicting PI nitrogen uptake for red edge imagery were developed for the Worldview-3, RapidEye and Ceres Imaging sensors; however, due to the cost of imagery, the latter two options were determined to be the most suitable for industry-wide application. 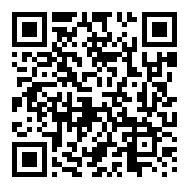 *This research was co-funded by the NSW Department of Primary Industries and AgriFutures Australia. View the full report on page 10-12 in the 2018 Rice R&D Update from AgriFutures.